4 Sneaky Sources Of Sugar! Life is sweet, all right—so sweet that that the typical person will consume about 13 percent of their daily calories from added sugar, or sugar that doesn't occur naturally in food. Compare that to the maximum of 5 percent of daily calories, or about 6 teaspoons, that the World Health Organization (WHO) recommends, and it's clear that our diets are a bit too sweet. One regular soda may have as much as 45 grams (11 teaspoons) of sugar, which is nearly double the recommended upper limit recommended by the World Health Organization. A 32-ounce serving of sweet tea contains 70 grams (17 teaspoons)! And the not-so-sweet news is that high intakes of added sugars can sour your health. Beyond the concern over raising the risk for type 2 diabetes and weight gain, researchers at the Centers for Disease Control and Prevention (CDC) discovered that people who obtained 10-24 percent of their calories from added sugar were 30 percent more likely to die from heart disease than those who consumed less. Unfortunately, cutting back isn't as easy as ditching obvious sources such as sodas and Cap'n Crunch. According to a study published in the Journal of the Academy of Nutrition and Dietetics, about 75 percent of packaged foods on store shelves now contain some sort of added sweetness. Even if you're making a conscious effort to stay away from traditional dessert-like items, you can still find just as much sugar in the so-called "healthy" snacks that rule the interior aisles of the grocery store. It's clear that food manufacturers want you to eat felonious amounts of sugar, even if you bid adieu to dessert. And it seems they're spreading it across all kinds of seemingly innocent foods to deliver it to you. Don't be an accessory to that crime and fall prey to these sneaky sugar smugglers. Here are four sneaky sources of sugar to watch out for! It's easy to become overwhelmed by the vast array of yogurt options now available in the dairy aisle. And if you don't choose carefully, you could end up spooning enough of the sweet stuff to make it a challenge to hold on to your abs. Case in point: vanilla-flavored yogurt. Even protein-packed vanilla yogurt can contain over 15 grams of sugar per serving! While it may seem healthier than fruit-on-the-bottom versions, vanilla yogurt can be just as much of a sugar bomb. Typically, a serving of vanilla yogurt contains three times as much sugar as its plain counterpart. In fact, up to half of the calories in a nonfat vanilla Greek yogurt can come from added sweetness. Sweet Nothings: To help keep your sugar intake in check, stick to a yogurt with a label that says "plain." If you are yearning for that warming vanilla flavor, simply add a splash of pure vanilla extract. And of course, if you're striving to look like a Greek god or goddess, be sure to grab protein-packed plain Greek yogurt instead of regular yogurt. Cow's-milk alternatives have become supermarket staples. Whether you follow a vegan diet, are lactose intolerant, or are simply looking to shake it up, there are plenty of plant-based milk options for you to choose from. While it may come as no surprise that chocolate or vanilla flavors also bring with them gut-busting sugars, what is less obvious is the sugar added to those labeled "original." The vast majority of original milk alternatives have an ingredient list that contains a sweetener such as evaporated cane juice—just another euphemism for sugar. Sweet Nothings: If you include these drinks in your diet, select those that contain the word "unsweetened" on the package. Do so, and you'll take in 6-7 times less of the sweet stuff. Staple peanut butter brands have long been known to infuse sugar and other sweet derivatives into their nut butters, but even more upscale brands are becoming known for their added sugary goodness. In recent years, the market has exploded with various guises of nut butters. Yes, I'm talking about your favorite chocolate coconut butter and white chocolate peanut butter treats. 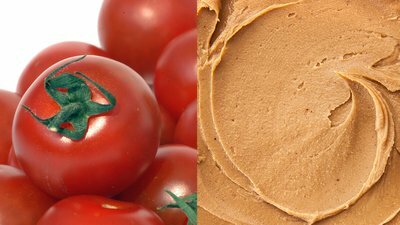 Some peanut butter brands deliver a whopping 15 grams of sugar per serving. Make sure yours has only nuts and a dash of salt. Sure, the sweeteners they use might be stuff like fruit-juice concentrate, maple syrup, or honey, but your body essentially breaks it down just like table sugar. In fact, a 2015 Journal of Nutrition study found that honey produces similar alarming metabolic effects—such as increased inflammation and blood triglycerides—as sucrose and high-fructose corn syrup when consumed in the same amounts. Both of those unwelcome metabolic effects raise your risk for heart disease. Given that one serving—which is one bite—may contain upwards of 15 grams, it may be best to stick with a simpler version of delightful nut butter. And no, I'm not talking about the reduced-fat nut spreads. Such products often contain more sugar to make up for the loss of flavor when fats are stripped away. Sweet Nothings: Nut butters can deliver some great stuff like healthy fats and must-have vitamins and minerals, but to make sure these come without the sugary baggage, read the ingredient label. You basically just want nuts and perhaps a touch of salt or other flavorings like cinnamon or cocoa. Mama Mia, shouldn't tomato sauce just be, well, tomatoes? Sadly, this is another example of how some food companies are trying their darnedest to keep your diet nice and sweet. Manufacturers add sugar to extend shelf life, reduce acidity, and help mask the lack of natural sweetness present in the less-than-stellar tomatoes jammed into the jars or cans. Some of the sugar listed on the nutrition panel of tomato sauce is naturally present in tomatoes. However, if the number starts moving well past a couple of grams, it's a good tip-off the brand has pumped in extra. Sweet Nothings: Luckily, plenty of tomato-sauce options on store shelves contain no added sugar, but finding them requires some label-sleuthing. You can also buy plain canned diced tomatoes (Italian-style San Marzano tomatoes are the gold standard for sauces) and rustle up your own sauce by simmering the tomatoes with seasonings like onion, garlic, smoked paprika and basil. Tomato sauce is often high in sugar because, manufacturers add sugar to extend shelf life, reduce acidity, and to help mask the lack of natural sweetness in sub-par tomatoes used to create the sauce. Tip: Don't forget that the other common red sauce—ketchup—is also a frequent sugar smuggler, containing 4-6 grams per tablespoon! To avoid falling into a sugar trap, you first have to become familiar with all the code words for it that can populate ingredient lists. Some may sound healthier than others, but once they pass your lips, there is not that much difference in how they work in the body. Use this list to diligently inspect labels, and never mind whether a labels says something like "no sugar added". You've got to read the ingredient list to know for sure. Ervin, R. B., & Ogden, C. L. (2013). Consumption of added sugars among US adults, 2005-2010. NCHS data brief, (122), 1-8. World Health Organization. (2015). WHO calls on countries to reduce sugars intake among adults and children. Press release, March, 4. Ng, S. W., Slining, M. M., & Popkin, B. M. (2012). Use of caloric and noncaloric sweeteners in US consumer packaged foods, 2005-2009. Journal of the Academy of Nutrition and Dietetics, 112(11), 1828-1834. Raatz, S. K., Johnson, L. K., & Picklo, M. J. (2015). Consumption of Honey, Sucrose, and High-Fructose Corn Syrup Produces Similar Metabolic Effects in Glucose-Tolerant and-Intolerant Individuals. The Journal of Nutrition, 145(10), 2265-2272.